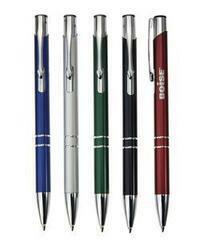 Metal Pens: Aluminum click-action ballpoint pen with chrome trim. 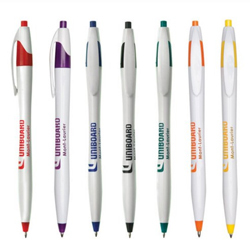 Decorating Area: Below the clip: 2" x 3/16"
Plastic Pens: Plastic click-action ballpoint pen. Decorating Area: In-Line with clip: 1¼" x ¾"